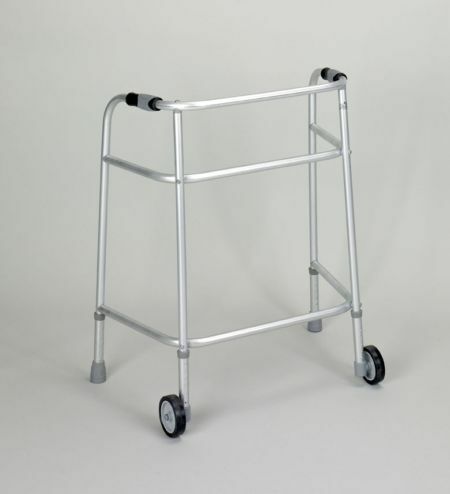 Bariatric Wheeled Walking Frame sturdy and Lightweight. This item is a non folding bariatric wheeled zimmer frame. It has been designed to assist in the treatment and recovery of the bariatric patient, and its robust construction and features reflect this. The two wheels at the front offer a high degree of mobility, and assist with both exercise and movement – so very important when working with this condition. Offering excellent stability and able to accommodate users of up to 35 stone, yet lightweight due to its aluminium construction. It is wide enough to accommodate the largest user, and height adjustable too. This is a bariatric zimmer frame with wheels that will encourage progress and recovery, and last for years and years.